• Feeder For Baby Chicks. • Constructed Of Heavy Duty Polyethylene. Base Features 8 Openings With Ribs To Minimize Feed Spillage. • No-Scratch-Out Twist Lock Base. • Feeds Approximately 25 Chicks. • To Be Used With# 690 Jar. • Jars Are Molded From Durable Transparent Polyethylene So The Water Level Is Always Visible. • To Be Used With# 740 Base. • Individual Holes Minimize Waste. Top Slides Off For Easy Access. • Made Of Heavy Gauge Galvanized Steel and Feature Rolled Edges For Safety. Comes with metal adjuster. Holds over 17lbs. . . .
• These Economy-Priced Feeders Are Designed Exclusively For The Hobbyist. • Feed Saver Lips Minimize Spillage. 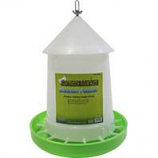 The 11 Lb and 22 Lb Feeders Feature Adjustable Feed Levels. • Anti-Scratch Vanes Help Prevent Crowding and Feed Waste. 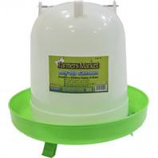 • Prevents Chickens From Scratching Or Sitting In Feed. • Perfect For Baby Chicks. Rounded, Embossed Edges Help Reduce Chafing On Neck and Head. • Fun Rolling Way To Supply A Treat Buffet Fill It Full Of Fesh Vegetables. 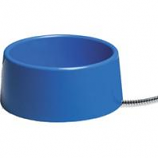 • Easy Open and Close Design For Convenient Feeding and Cleaning. • 12 Lb Hanging Feeder Tube With 12 Feeder Pan. 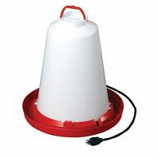 • Little Giant Hanging Feeders Are Constructed Of Heavy Gauge Galvanized Steel With Rolled Edges For Safety. • Edges Are Rolled For Safety and Feature Arched Inner Handles For Added Strength. • Brass Valves and Rubber Seals Produce A Positive Water Shut Off. • Seams Are Constructed and Tested To Prevent Leaks. • Founts Also Feature A Locking Pin. • 1 Quart Galvanized Jar Water Base.